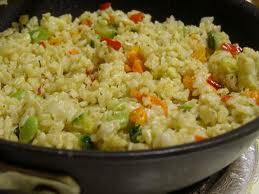 As stated earlier, rice is featured heavily in the Ayurvedic yogic diet. In India most meals are served with basmati rice, a light and aromatic long-grain variety with a cooling effect on the body. It has a balancing effect on the digestive system and soothes the nervous system. Basmati rice is good for calming an irritated gut and it is easier to digest than brown rice. Adding a couple of cloves of garlic to the rice when cooking normally helps to gently warm the slight coolness of the grain. Wash rice in cold water several times to remove much of the starch, changing the water until it is clear. For 1 cup of rice, bring 1¾ cup of water to boil. Add the rice, a Tbsp. of ghee, ½ tsp. turmeric powder and a pinch of salt to taste. Reduce the heat, cover and cook for 10-15 minutes, by which time all the water should be absorbed. Remove from the heat and allow to stand for 5 minutes before removing the lid. Cook on medium heat until mustard seeds pop, then add ¼ – ½ tsp chilis, cooking just till browned. Add the rice, ½ tsp. turmeric powder, ½ tsp coriander powder and 1 tsp of salt. Reduce the heat, cover and cook for 10 minutes. Add ½- ¾ cup diced vegetables of your choice ie: fresh peas, carrots, green beans, broccoli, asparagus are all vegetables that compliment the rice. Cover and cook for 5-7 minutes, or until water is absorbed. Let sit a few minutes, stir gently before serving. Optional: Add 1 Tbsp. butter to the cooked mixture after turning the heat off.